Well here we are again! This Friday and Saturday wrestling fans will be treated to some of the toughest high school wrestling in the nation at the 2017 Eastern States Classic. The tournament takes place at the field house on the campus of SUNY Sullivan in Loch Sheldrake. Wrestling will begin at approximately 10:30 on Friday and run all day. Sixteen wrestlers in each weight class (8 in the championship bracket and 8 in the consolation bracket) will advance to Day 2 on Saturday where wrestling will begin at approximately 9:00 am. Below are several documents that you may find useful and/or interesting. Now let’s take a look at some of the wrestlers to watch at this year’s event! Our lightest weight class is always one of the most interesting to follow because the vast majority of the entries have no accolades at the varsity level and this is their first opportunity to prove their post-youth wrestling mettle! Brandon Nunez from John Bowne (PSAL) placed 5th here last year and 6th in Albany and should definitely be considered one of the favorites. Mahopac’s Garret Semetz was a match away from placing at states and will be tough here as well. Josiah Encarnacion from Wantagh is currently the top ranked wrestler in Section 8 according to LIWA while Christian Gannone from Eastport South Manor holds the same distinction for Section 11. Terry Adams from Monsignor Farrell and Rick D’elia from Port Jefferson are both returning state qualifiers while some other wrestlers to watch include Ryan Burgos (Hilton), Brock Delsignore (South Glens Falls), Dennis Robin (Arlington), Pablo Martinez (Long Beach), Ivan Garcia (Port Chester), CJ McMonegal (North Rockland), Mason Bush (Central Valley), and Logan Dubuque (Peru). Section 9 has a few 99 pounders that we should keep an eye on! Minisink Valley’s Nick Picariello is 20-2 with his only losses coming to wrestlers from NJ at 106. Middletown’s Justin Morales, Cornwall’s Christian Prokosch, and Monroe Woodbury’s Nick Scancarello are all having very good seasons as well! This weight class boasts a D2 state champion as well as three wrestlers who placed in the ESC at 99 pounds last year including the champion, Dylan Ryder from Half Hollow Hills West. Ryder is currently ranked #20 in the nation by FloWrestling and was also a D1 state finalist last year. Jon Charles from Section 3’s Central Valley Academy was the D2 state champ at 99 last year and should go deep here. Zach Redding from Eastport South Manor placed 7th at 99 at least year’s ESC while Deer Park’s Preston Maucere finished 8th. Matt Griffin from Jamesville Dewitt CBA in Section 3 finished 3rd in NYS D2 at 99 last year. Some other wrestlers to watch here include Matt Garland (Sandy Creek-South Jefferson), Joe Becker (Lynbrook), Joe Castrasano (Carle Place-Wheatley), and Antoine Grace (Queensbury). Section 9 has a strong contingent entered here in Dylan Earl and Ryan Burgos both from Monroe Woodbury, Greg Fischer (NFA), Hunter Brown (Warwick) and Kevin Urena (Pine Bush). This weight is definitely stacked with some talented wrestlers but the clear favorite here is Greg Diahomihalis from Hilton. He has been nationally ranked this season and was the 99 pound NYS D1 champion last season. Check out the list of wrestlers entered at this weight that placed in the NYS tournament last season: Kevin DePalma (Farmingdale), Justin McDougal (Niagara Wheatfield), Eli Rodreguiz (Norwich), Mike Bruno (Putnam Valley), Anthony Sciotto (Rocky Point), Bryce Smith (Saranac), Trey LeFlamme (South Jefferson – Sandy Creek), Zach Braddell (Tonawanda), David Traub (Tottenville), and Caleb Robinson (Walton-Delhi). A few other names to watch for include Jared Altan from Plainedge and Jonathan Spadafora from Half Hollow Hills East. Section 9 has a few bonafide studs entered here in returning state qualifiers Tyler Lynch (Minisink Valley) and Marco Vespa (Monroe Woodbury). Both could definitely contend for a spot on the medal stand! Matt Romano from Valley Central has been awesome this year and is definitely worth keeping an eye on at 113! Also a very deep weight class this year however nobody in the field has the credentials of Eastport South Manor’s Adam Busiello. Adam is currently ranked #1 in the nation (@113) by FloWrestling! He won the ESC at 106 last year, he is a 3X state finalist and he has been the NYS D1 champion the past two seasons! One of the wrestlers expected to challenge Busiello here is his opponent from last year’s ESC finals, Orion Anderson from Schuylerville. Anderson was the D2 state champ last season and a state finalist in 2015. Wayne’s Matt Caccamise was also a state champion in D2 last year and has been dominating the competition thus far this season. Danbury’s Jakob Camacho finished 7th at last year’s ESC and was a CT state champ last season. He had a monster off season and has been a wrecking ball this season and is now ranked 13th in the nation at 120 by FloWrestling. Rocky Point’s Anthony Cirillo finished 3rd at last year’s ESC at 113 and is a 2X state place winner; expect him to go deep here as well as Cahal Donovan from Phoenix who finished 2nd in NYS D2 last season. Justin Hoyle (Wyoming Seminary), Alex Samson (Victor), and Tony Negron (North Babylon) all placed at the ESC last year and could contend here. 120 has a few out of state studs to watch! Joe Pilecki of Noble was a Maine state finalist last year and Matthew Garcia is a 3X 3rd place finisher in Massachusetts. We also need to keep an eye on Carson Dobozy (Peru), Joe Tolson (Framingham,MA), Joe Simons (Farmingdale), Luke Bokina (Mattituck), Nick Young (Alexander), and Tyler Albis (JJEF). Our Section 9 entries at 120 include Patrick Owens (Monticello), Brandon DeLaRosa (NFA), James Faison (Wallkill), Chris Bouton (Kingston), Carson Sauschuk (Port Jervis), Sean Savacool (Minisink Valley), Joe McGinty (Monroe Woodbury), Tommy Askey (Pine Bush), and Derrick Magsamen (Pine Bush). With several very good wrestlers but no clear favorite, this is going to be one of the most exciting weight classes to watch at this year’s ESC. 126 has 4 returning ESC placewinners and 12 wrestlers who have placed in their state tournament – 7 of them are multi-time placewinners! Jake Martel from Noble, ME was a state champion last year and finished 3rd in 2016. Section 8 D2 power Locust Valley has two former NYS champions entered here in Hunter Dusold and Jonathan Gomez. Sean Wagner from Southington, CT placed 3rd and 4th in the state the past two seasons while Kyle Fields from Danbury took 4th in CT last year. Jack Bokina from Mattituck is a 3X D2 state placewinner and is undefeated this year. Speaking of undefeated wrestlers, Ben Tepperman (Hauppauge), Randy Earl (JJEF), CJ Walz (Central Valley Academy), and Austin Hertel (Hilton) are all undefeated so far this season and could cotend for a medal here. Luca Errico (Byram Hills) and Mike Killard (Wantagh) are also extremely tough! Section 9 has some very talented wrestlers entered at 126 including Andrew Davis (Wallkill), Robert Satriano (Valley Central), Cameron Wernicki (Monroe Woodbury), Nick Albornoz (Minisink Valley), Emanuel Ward (Monroe Woodbury), Chris Massaro (New Paltz), Nate Ross (Onteora), Nick Florin (Pine Bush), Najee Shakleford (Monticello), and Thomas Maddox (Washingtonville). This is another very deep weight class but all signs point towards a showdown between 3X NYS D1 champion Jacori Teemer from Long Beach and 2X NYS D2 champion (3X finalist) Dane Heberlein from Alexander. Teemer is currently ranked #9 in the nation by Flo and #8 by Intermat. Some of the other guys that we can expect to see battling it out for a step on the medal stand include Keith Gordon (Springfield Central, MA), Tagan Welch (Southington, CT), Matt Maquet (Long Beach), Matt Swanson (Lynbrook), Mike Venosa (Victor), and Chris Gomez (Pat-Med). Noah Carpenter (Elmira), Louie Cree (JJCR), and Tanner Lapiene (Ogdensburg) are also very tough. Section has a strong contingent entered at 132 led by Mid Hudson Tournament finalist Ian Houck from Rondout Valley. Brad Bonner (Wallkill), Anthony Sountis (Monroe Woodbury), and Vinny Vetrano (Minisink Valley) could also make some noise at 132 and we can’t overlook Middletown’s Tyler Matos. 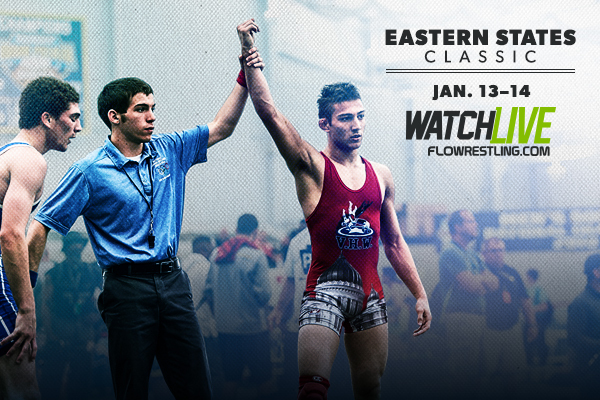 Every weight at the Eastern States Classic is tough and is filled with talented wrestlers. That said, 138 is probably a contest for 2nd place because of the heavily favored Vito Arujau from Syosset. Vito is currently the #1 ranked 138 pound wrestler in the nation by Flo and Intermat. He is a 3X ESC champion and a 3X NYS D1 champion. This past summer he won the silver medal at the Cadet World Championships in freestyle. Yeah he’s pretty good! Some of the wrestlers who will be trying to pick off Arujau include nationally ranked Jake Silverstein (Haupaugge), MA state champ Pablo Ogata (Framingham), 3X Maine place winner Austin Shorey (Noble), former NYS champion Benny Baker (Wyoming Seminary), 3X state placer Kyle Mosher (South Side), and Christian Gramuglia (Burnt Hills). Some others to keep an eye on include Derek Osman (Vestal), Garret Gibbons (Massapequa), TJ Philpotts (Holland Patent), and Ray Cotto (JJCR). Section 9 has a returning state qualifier entered here in Dom Vetrano from Minisink Valley while Monroe Woodbury’s Louis Libutti is having a strong season as well. Season ending elbow surgery to 2X Cadet World Champion and 4X NYS champion Yianni Diakomihalis has completely changed the landscape of the 145 and 152 pound weight classes! (Rest assured that some of the wrestlers that are entered at 145 would be at 152 if Yianni was healthy.) The prohibitive favorite at 145 is Penfield’s Frankie Gissendanner. Frankie is the defending ESC champion at this weight and he is a 2X NYS D1 champion. Gissendanner is currently ranked 7th in the nation at 152 by Flo and 9th by Intermat. He will however see plenty of competition here from wrestlers such as Austin Abacherli from Southington, CT who is a 3X state place winner, Matt Gripp from Fox Lane who was a ESC finalist at 138 last year, Tanner Cook from Central Valley Academy, and Ross McFarland from Phoenix both of whom were state finalists last season. A few other studs to watch at this weight include Kiernen Shanahan (Shenedehowa), David Miele-Estrella (North Babylon), Phil Spadafora (Half Hollow Hills East), Shane Gibbons (Massapequa), John Coletti (Long Beach), Ty Rifanburg (Norwich), Connor Day (Iroquois), Zach Lawrence (Duanesburg), and Lucas Pincus (Hewlett). Section 9 has a few kids to keep an eye on here especially Brandon Bobe from Washingtonville and William Harrison from Port Jervis who are currently undefeated, and Tom Fini from Monroe Woodbury, Shaun Burgos from Pine Bush, and Tyler Serafini from NFA who have been very tough this year. Steven Gazzillo (Cornwall), Mike Kubik (Goshen), Justyn Kelly (Monticello), and Zach Chartrand (Onteora) are also entered here and can definitely notch a few wins! This is going to be one of the more interesting weight classes to follow at this year and it also happens to be a weight where a Section 9 wrestler has a legitimate shot at taking the title! Monroe Woodbury senior Evan Barczak is a 2X state place winner and has been nationally ranked as high as #18 by Flo this season. Hunter Richard from Holland Patent is a 2X D2 state champion and he placed 6th here last year. Peter Pappas is a 2x state finalist and is currently ranked #17 by Intermat and #20 by Flo. Connor Melbourne from John Jay Cross River finished 2nd at last year’s ESC and took 5th in Albany. Long Beach has two contenders entered here in Tyrese Byron and Charlie Spada. Some other wrestlers to keep an eye on include Section 9 contenders Nijee Noble (Kingston), Tristen Schiafo (Red Hook), and Dillon Ross (Onteora). Billy Sims from Lindenhurst, Demetreus Henry from Grand Street Campus, Joe DiForte from Petrides, Justin Post from Newark Valley,and Cole Rifanburg from Norwich are all very tough as well! This is another weight where Section 9 has one of the favorites to take home the title! Warwick senior Ryan Ferro is a returning state champion and he is having an outstanding season. He recently pinned Grant Cuomo from Brewster who is a returning state placewinner and is also entered here. One of the other wrestlers that could give Ferro a run is also from Section 9 – Eldred/Liberty/Sullivan West senior Noah Curreri! Curreri is undefeated this year and just won MOW honors at the Russ Cordell Rotary. Noah Grover from Warsaw finished 3rd in NYS D2 last year and should definitely go deep here. Another wrestler that we should definitely watch out for is Wantagh’s Jonathan Loew – he has been an absolute buzzsaw this year including a convincing win over Long Beach’s Tyrese Byron. Other wrestlers who are definitely in the hunt at 160 include Charlie Mahon (Elmire), Kyle Janeski (Albany Academy), and Jake Logan (New Rochelle). Section 9 has two other kids entered here both of whom are having great seasons, Timmy Ganuncio from Minisink Valley and Owen Daly from Pine Bush. This is probably one of the most wide open weights at the Classic this year with about 6 or 7 kids having a legitimate chance of taking the title. Jason Hoffman placed 2nd at the ESC last year and is also a 3X state placewinner whi is currenly ranked #20 in the nation by Intermat. Shawn Mosca from Carle Place – Wheatley came in 2nd in NYS D2 last year and placed 5th at the ESC. Tyler Barnes from Ballston Spa placed 3rd at this weight at last year’s ESC and has also placed in Fargo. Some other wrestlers that will be fighting for a spot on the medal stand are Jacob Smeader (Hamburg), Nick Gaiser (Alexander), Jordan Wallace (New Rochelle), and Zack Ancewicz (John Glen). Section 9 will be well represented at 170 by Adonis Morano (Middletown), Maxx DeCapua (NFA), Mark Ohanian (Valley Central), Demetrius Moore (Minisink Valley), Jason Butler (Port Jervis), Tajh Ali (Middletown), and Nick Solek (Washingtonville). This weight class is Louis Deprez’s to lose. The Hilton senior is a 2X defending state champion, returning ESC champion, and is currently ranked #2 in the nation by Flo and Intermat. Deprez will be attending Binghamton in the fall. There are several outstanding wrestlers who have their sights set on picking off Deprez. Evan Frank from John Jay Cross River finished 2nd at last year’s ESC to Deprez and also finished 3rd in NYS D1 and he’s having a great year. A wrestler who has a couple of recent wins over Frank, however, is Mike Fekishazy from Wallkill. Fekishazy finished 6th in NYS last year and he’s having an awesome year thus far including wins over Frank and James Hoeg (Mattituck) who is another wrestler who will contend here. Hoeg was 5th at last year’s ESC and took 4th in NYS D2. Clifton Wang from Edgemont is a 2X D2 NYS place winner and he also finished 8th at last year’s ESC and Tyreek Bromley from Long Beach is always dangerous. Simon Chee from Benjamin Cardozo is having a great year including a win over Wang. Fekishazy is not the only Section 9 wrestler who could do well at 182. New Paltz senior Ben Cuppett is a multi time state qualifier while Minisink Valley junior Joey Yanis was a S9 finalist last year and is having a great 2016-2017 campaign. Yanis has only one loss and that was to a NJ wrestler at the Linn Crawn Tournament in Kittatinny, NJ. The other S9 wrestlers entered here are Henricus Van Heemstede Obelt (Washingtonville), Will Leonard (Cornwall), and Ben Santarpia (Washingtonville). With no state champions and only six total wrestlers who have ever placed in the NYS tournament, 195 will be one of the most wide open weight classes in the tournament. As far as the favorites, let’s start with Joe Benedict from South Jefferson – Sandy Creek. Benedict finished 2nd in NYS D2 as a sophomore and has been absolutely dominating the competition this year. Mattituck’s Tanner Zagarino finished 3rd in D2 NYS last year and has also been very tough this year. Hilton senior Mike Spallina is always tough – he’s actually the only wrestler in this weight who has ever placed at the ESC finishing 8th at 182 last season. Although not as credentialed as some of the other wrestlers here, Long Beach’s Elijah Rodriguez is definitely one of the favorites here. He has made huge strides in the off season and has been very solid this year and is undefeated thus far. A few other wrestlers to look out for here are Travis Race (Phoenix), Andrew Marquis (Danbury), and Connor Breit (Nanuet). Section 9 has a few wrestlers to watch here namely Andrew Covais (Minisink Valley), Alex Leonty (Washingtonville), Samson Perez (Monroe Woodbury), John Goodell (E/L/SW), Billy Kras (Wallkill), Tom Kearns (Goshen), John Cassidy (Cornwall), and Julius Oquendo (Middletown). There are definitely some quality 220 pounders entered here but all signs are pointing towards a showdown between last seasons D1 state finalists Terron Robinson and Section 9’s Ryan Ellefsen from Goshen! Robinson defeated Ellefsen in the NYS finals in one of the most exciting matches of the tournament. Both wrestlers also placed at last year’s ESC – Robinson came in 2nd while Ellefsen took 7th. There are several other wrestlers who will be looking to upset the big dogs including Mason Mastrangelo (Lancaster), Mason Hoose (Canisus), Halil Gecaj (John Jay Cross River), Gavin Casey (Wantagh), and Damien Caffery (John Glenn). Besides Ellefsen, the other Section 9 entries at 220 are Horace Duke (Middletown), Scyler Phillips (Port Jervis), and Andrew Slagle (Minisink Valley). With only three returning state qualifiers and no state place winners entered, 285 could prove to be a wide open weight class this year! Jake Warren from Burnt Hills placed 8th at last year’s ESC andis definitely one of the favorites here along with Eagle Academy’s Jason Gomez who represented the PSAL in Albany last February. John Monroe from Hauppauge and Bim Gecaj from John Jay Cross River have also had great years and will certainly contend here. Amityville’s Deonte Wilson was a sectional finalist last year and has been impressive this year as has Lucas Sanders from Glens Falls. Section 9’s best chance for a placewinner here is probably Andrew Fenner from Minisink Valley who has defeated every local opponent he has faced thus far. Norris Gipson from Middletown is very dangerous and shouldn’t be over looked either. Section 9 will also be well represented at 285 by Austin Taylor (Warwick), Will McCartney (NFA), and Owen Astigarraga (Cornwall). Flowrestling will be streaming matches LIVE on all 9 mats! Click on the image to the left for access. Can’t attend the but you want to stay up to date on the results … EscapeSports will prove updated brackets over both days! You like to blog … New York Wrestling News will be blogging on Day 2 of this years ESC! Click on the image to the left to follow! 99 – Anthony Stramiello loses in consies…he is out. 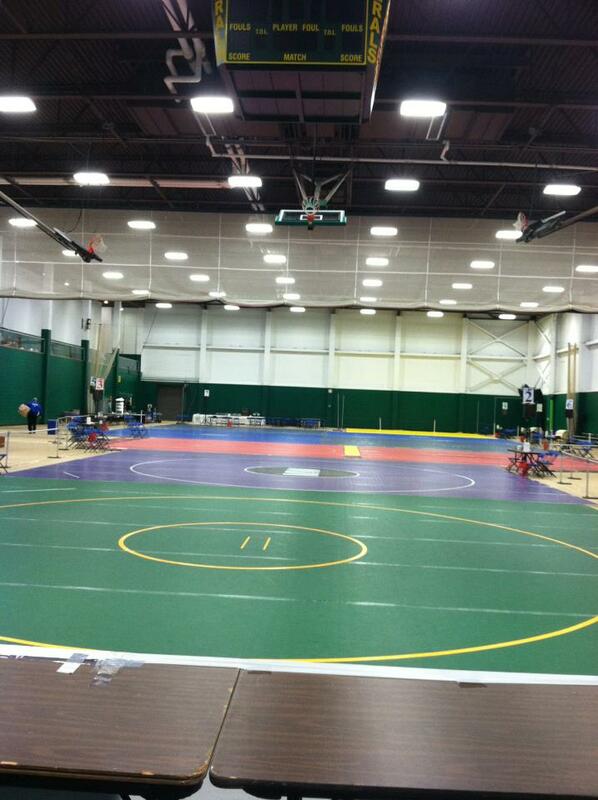 Check out some of these shots from the 2013 Eastern States Classic. 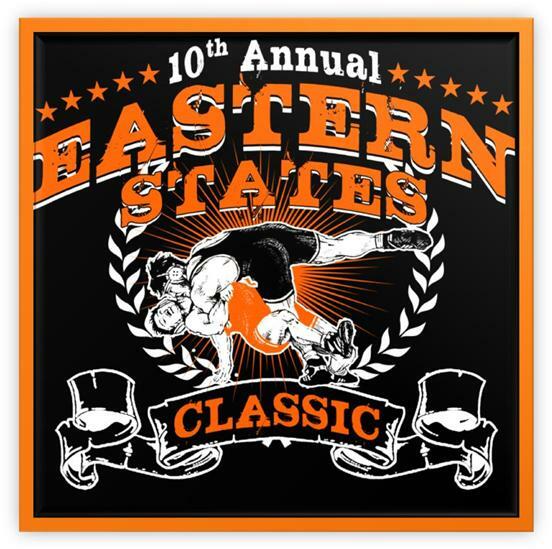 Just a quick reminder that the 2013 Eastern States Classic, brought to you by the Friends of Section 9, is less than two weeks away. The event, now recognized as one of the most competitive high school wrestling tournaments in the nation, is scheduled for Friday and Saturday, January 11th and 12th, at SUNY Sullivan in Loch Sheldrake NY. This year’s Classic will be as competitive as ever! As of this moment, 114 teams will be represented including teams from NY, CT, MA, and VA. Our preliminary list of entries includes 81 former state place winners and 13 former state champions! 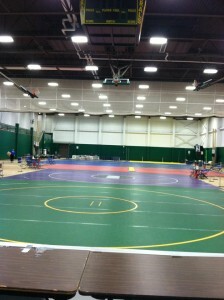 Check back next week for www.sectionixwrestling.com ‘s tournament preview! Eastern States Classic Singlets For Sale!!! Hey check out the new singlets that AC Sports is selling at this year’s Eastern States Classic. Top quality Adidas singlets for only $25! T-shirts, long-sleeve shirts, hoodies and other apparel will, of course, still be available! All proceeds go to the Beat the Streets USA wrestling program. Pre-order information coming soon! Posted on November 28, 2011 November 28, 2011 Author Mike CareyCategories Eastern States Classic5 Comments on Eastern States Classic Singlets For Sale!! !